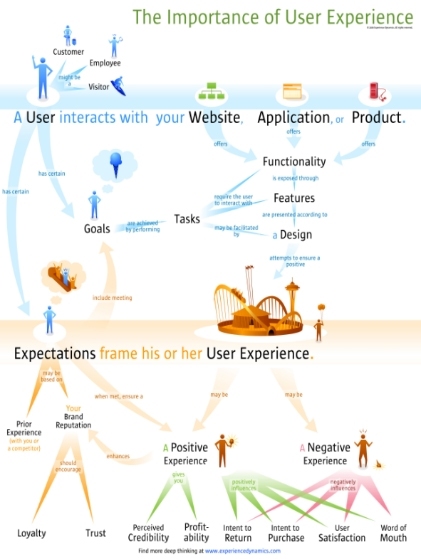 Demystifying Usability : The Importance of User Experience- the Poster! In my experience, it is wise to measure this from a web analytics AND usability research perspective. Usability tests are a great way to expose a design to all measurements (ease of use, ease of understanding, user satisfaction, perceived pleasure, purchase intention and intent to return). Contact with users provides that *context* that pure web analytics measurements do not. "On the web, customer retention can be defined as whether or not a customer decides to return to a website. In terms of metrics, this can be quantified as the number of customers who a) intend to return and b) intend to purchase again from the website". User satisfaction is often not studied in detail. It is usually just referred to in a paper or article. I am guilty of that, as is Jakob Nielsen in his writings. "Two important aspects of the overall consumer satisfaction are: (i) the level of satisfaction associated with the final chosen product (e.g., Day, 1984; Spreng et al., 1996), and (ii) the level of satisfaction associated with the purchasing process (e.g., Arnould and Price, 1993; Oliver, 1993). The former has been referred to as the product satisfaction and the latter has been referred to as the process satisfaction. The product satisfaction can be measured in two aspects: (i) a holistic satisfaction towards a chosen product (Spreng et al., 1996) and (ii) the specific levels of satisfaction towards the product attributes (Oliver, 1993). A typical means to evaluate product satisfaction is to measure rated consumers’ affective responses to the selected products (Cole and Balasubramanian, 1993; Westbrook, 1987; Mano and Oliver, 1993; Westbrook and Oliver, 1991)". Another excellent study that shows the link of user satisfaction to perception of pleasure and emotional aspects of a design (aka Emotion Design- my earlier post), too long to quote... "A systematic approach for coupling user satisfaction with product design" by Han, Sung and Hong, Sang in Ergonomics (2003) v 46. no 13/14. I am really happy how the poster turned out! Bryce Glass and I collaborated on this together. I was impressed by his earlier efforts to illustrate a "Flickr user model". Bryce's mastery of Illustrator is note-worthy, even if you think the poster is cluttered (If you do, take your time with it and don't take it too seriously- it's an inspiration piece). Users were interviewed, Bryce's earlier design was analyzed for what works and what doesn't work. We learned a lot from each other about visual design and the usability of flows... and the result is what you see above. This lead me to have the poster printed out to help teams evangelize usability! (production and design costs were paid for by my company, Experience Dynamics). This poster is an upgrade, if you will, to the UPA poster that hung on walls in team areas where I worked in the past and also the little IBM posters that you see around people's cubes. If you are interested in translating this poster, I will send you a free printed English version;-) (Inquire about poster translation). Since putting this shout out a few weeks ago, many people have expressed interest in translation- the result is below. Coming soon: Turkish, Polish, Hebrew, Portuguese, Russian. Buy a poster, and support the poster project. p.s. Is there a usability topic or theme that you would like to see clarified with a visual like this? Usability and User Experience certainly has a larger scope than that. If you're looking for more poster ideas, you could turn this into a series - the Importance of User Experience for Consumer Products, or for Enterprise Systems (a topic close to my heart), or for Technical Equipment. Can you please clarify to me, what impact will, if into force form will have on a company like for an example Ralph Lauren Polo, that have a registered trademark in China? Can the Company force a website selling counterfeit RLP items to remove them. You did not use the right term for one of the translations, Chinese (Mandarin). Mandarin is referred as the spoken (not written) part of the language. In writing, you should use Chinese (Simplified) in your case. The other written form in Chinese is Chinese (Traditional). This is very nice. You might want to clarify the subject, though - this is the Importance of User Experience...for commerce web sites.